Hi friends! I'm so excited to share with you my finished St. Louis quilt top! I really love the way it's turned out, and it really was such a joy to piece. Using mainly a mix of Pam Kitty Love, Happy Go Lucky and Little Red Riding Hood to make is super bright and happy :) Find the tutorial here. I think it really shows off the fabrics well. It's huge too! I made the 5x6 blocks measuring 70" x 84", which is plenty big enough for me! luckily Robin is 6ft 1, he comes in rather handy for 'prop styling' ! Super cute, the boy and the quilt! It looks lovely and cosy, simple quilts can be so effective done well like this one. It turned out great! Love the bits of bright in there. And the fact that you got help from Robin...quite incredible. I know just how hard it is to sign up the help for photos. Glad he suffered through it. The shots are wonderful. What a great way to bust some stash! Yours is very coordinated though. Beautiful. So nice result!!! :) J. Such a pretty quilt top Jesse! Bet it was quick to put together too. Haha nice pics of your fella. I've never asked mine to hold a quilt for photographing. I know what looks I'd be getting. The furrow n his brow would be even deeper! 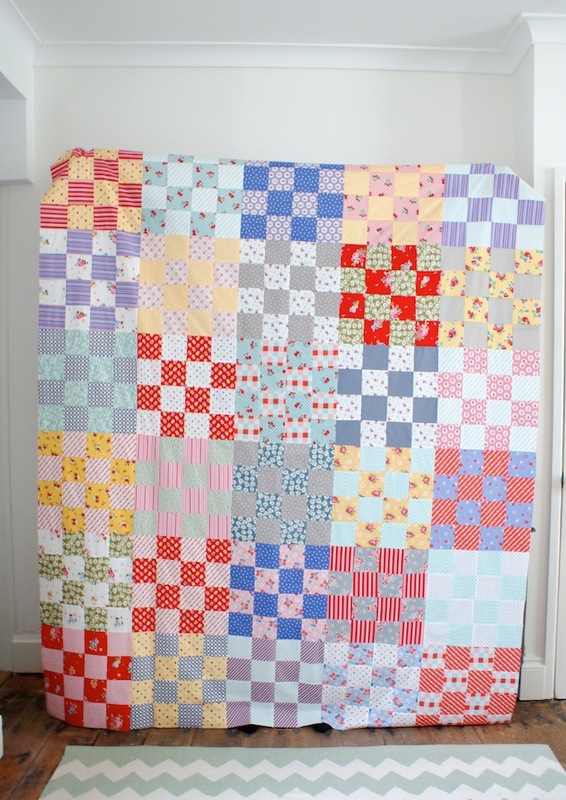 Love the colour balance of this quilt, nice job!